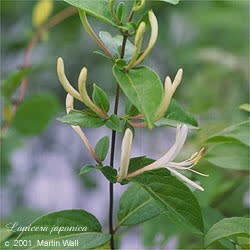 The genus name Lonicera is taken from that of Adam Lonicer, a sixteenth-century German physician and naturalist. The common name honeysuckle refers to the practice of sucking the sweet nectar from the blossoms. Most varieties of honeysuckle are woody, twining vines, though some are shrubs. The leaves are opposite and oval; the stem is reddish brown. The yellow, white, pink, or red flowers are very fragrant and can attract hummingbirds and butterflies. A reddish orange berry appears after the flowers. Honeysuckle requires only modest amounts of water and will tolerate shade. In warmer climates, however, it is considered an invasive species. Honeysuckle clears damp heat and removes toxins. Prolonged use is reputed to prolong life and increase vitality. Research in China is indicating that honeysuckle may be helpful in the treatment of breast cancer. Honeysuckle flowers are used to treat allergies, appendicitis, asthma, bacterial infection, boils, bronchitis, cancer, carbuncles, colds, cough, Crohn's disease, diarrhea dysentery, ear infection, eczema, eye inflammation (conjunctivitis, uveitis, keratitis), fever, fibrocystic breasts, flu, food poisoning, headache, heavy metal toxicity, hepatitis, high cholesterol, infection due to injury, itchiness, laryngitis, lymphatic swelling, mastitis, pneumonia, poisoning, psoriasis, rheumatism, sinusitis, sore throat, strep throat, tonsillitis, tuberculosis, and ulcers. The stems are used to treat appendicitis, hepatitis, mumps, pneumonia, and rheumatism. Topically, honeysuckle can be used as a compress to treat bruises, poison oak or ivy, rash, sore eyes, sunburn, swellings, and tumors or as a gargle to treat sore throat and ulcerations. The flowers are sometimes included in mouthwashes to treat mouth ulcers. Honeysuckle flowers are edible (many remember sucking the raw nectar from honeysuckle flowers); as buds they can be added to stir-fries or other cooked dishes. The tea prepared from the flowers, when iced, makes a refreshing, cooling summer beverage. The leaves also make a delicious tea and are sometimes used as a green tea substitute. Beware the fruits, which are cathartic and emetic. The stems are placed under bed pillows to facilitate sleep and are also used in basket weaving. The flowers and leaves are sometimes added to potpourri. Honeysuckle is sometimes used in cosmetic creams to soften skin. Avoid honeysuckle in cases of excessive phlegm, inflammation in the upper respiratory tract, or watery diarrhea due to internal coldness. Do not use for more than seven days in a row. Avoid using honeysuckle berries, which are toxic. The caprifolium and periclymenum varieties are used only externally.